The MOST (Method of Splitting Tsunami) model, developed by Titov of PMEL and Synolakis of University of Southern California, is the standard model used at the NCTR. MOST is a suite of numerical simulation codes capable of simulating three processes of tsunami evolution: earthquake, transoceanic propagation, and inundation of dry land. 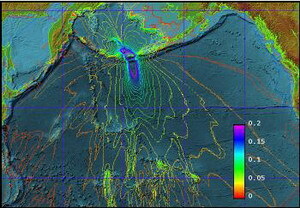 MOST Model simulation of tsunami on June 10, 1996 Andreanof Island, AK. . The MOST model has been extensively tested against a number of laboratory experiments and was successfully used for simulations of many historical tsunamis. Several research groups around the world now use MOST for tsunami mitigation. The main objective of a forecast model is to provide an estimate of wave arrival time, wave height and inundation area immediately after a tsunami event. Tsunami forecast models are run in real time while a tsunami is propagating in the open ocean, consequently they are designed to perform under very stringent time limitations. Given the time constraints of this type of study, the process of computing the three stages of tsunami modeling, namely, wave generation, propagation and inundation has been expedited by generating a database of pre-computed scenarios. The pre-computed database contains information about tsunami propagation in the open ocean from a multitude of potential sources. When a tsunami event occurs, an initial source is selected from the pre-computed database. In the initial stages of the tsunami, this selection is based only on the available seismic information for the earthquake event. As the wave propagates across the ocean and successively reaches the DART systems these report the recorded sea level information back to the TWCs which, in turn, process the information and produce a new and more refined estimate of the tsunami source. The result is an increasingly accurate forecast of the tsunami that can be used to issue, watches, warnings or evacuations. When an event similar to one of the pre-computed scenarios occurs, the available propagation information is used to compute the last stage of the study, wave inundation. An inundation modeling study attempts to recreate the tsunami generation in deep or coastal waters, wave propagation to the impact zone and inundation along the study area. To reproduce the correct wave dynamics during the inundation computations high resolution bathymetric and topographic grids are used in this type of study. The high quality bathymetric and topographic data sets needed for development of inundation maps require maintenance and upgrades as better data becomes available and coastal changes occur. Inundation studies can be conducted taking a probabilistic approach in which multiple tsunami scenarios are considered, and an assessment of the vulnerability of the coast to tsunami hazard is evaluated, or they may focus on the effect of a particular ‘worst case scenario” and assess the impact of such a particularly high impact event on the areas under investigation. The results of a tsunami inundation study should include information about the maximum wave height and maximum current speed as a function of location, maximum inundation line, as well as time series of wave height at different locations indicating wave arrival time. This information can be used by emergency managers and urban planners primarily to establish evacuation routes and location of vital infrastructure.